The German word ›Ermittlung‹ can be literary translated as »to center sth.« but is also used in terms of »investigation«. 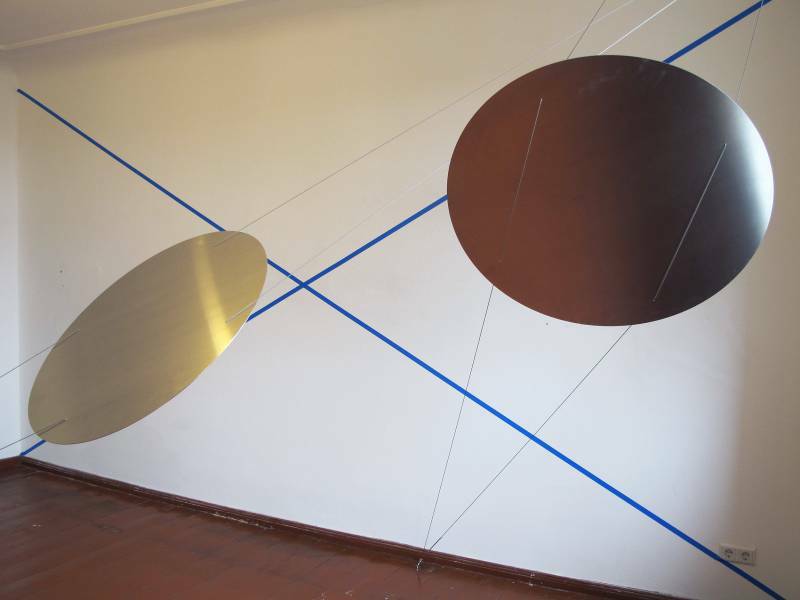 My installation Ermittlung is dealing with formal and physical ideas of a center or of centering. It consists of several works which are related to each other. Starting point was the phenomena of ›swinging‹, an act which performs the body center. By extending out and drawing in the extremities in a constant rhythm the physical center is playing with gravity. The two aluminum circles stretched between the ceiling and the floor are representing the movement of swinging. Through a simple intervention, by mounting tape from one corner to the other, I mark the center of the dominant wall of the exhibition space. The black and white photograph Fundstück (Kreis+Trapez) shows an urban ornament found on a sidewalk in Kasan (Russia). In Extremitäten (Kreis) I cut forms from cardboard which grow out of circles. The circle appears as a flat and repetitive form while the variable cutouts are becoming sculptures by expanding in an architectonical manner.